This Property is well located just off of Owen K Garriott in a nice neighborhood. According to the Garfield County Assessor this home consists of 1,926 sq.ft with a detached garage. 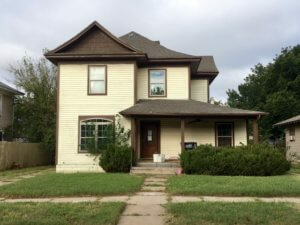 This 2 story home offers 4 bedrooms, 2 bathrooms and is currently in a renovation process. This property is currently in a non-livable condition that has tons of potential that you don’t want to miss!For more information or appointment to view, contact Brady Lippard at 580-747-2304 or 580-237-7174. Legal Description: Lot 16 Block 12 Garland Addition Garfield County Oklahoma. Auctioneers Note: This property is subject to court approval.